The Sigma Makeup Mrs. Bunny Travel Kit. All the brushes in the Mrs. Bunny Travel Kit! All 7 of the brushes in the kit. Close-up of the Foundation Brush – F60. What did you get on Cyber Monday this year? I got myself the Sigma Makeup Mrs. Bunny Travel Kit from none other than Luxola because they were having a 35% off our purchases when we paid with a UOB credit card. I also bought the Butter London Top Coat but I’ve yet to use it, so a review on that can only come later. By the way, I’m already in the Christmas holiday mood, so I thought I’d use my new dress from ASOS as a backdrop for this shoot! Yes, it’s all glittery and glam! And why not match it with my new set of brushes? The brushes in this kit came completely wrapped and nicely settled in a baby blue case, which can be undone and used as two separate brush holders. How convenient! 1) Large Powder Brush – F30: Very dense with a rounded top. Ideal to apply powder products on face and body. 2) Large Angled Contour Brush – F40: The angled shape makes this brush ideal to apply blush or contour shades. 3) Foundation Brush – F60: Can be used to apply liquid or cream foundation. Recommended to apply moisturizers and conceal large areas. 4) Tapered Blending Brush – E40: Soft and dense with a rounded finish. Can be used to apply pressed or loose eye shadows and pigments. 5) Eye Shading Brush – E55: Rounded and tapered top. 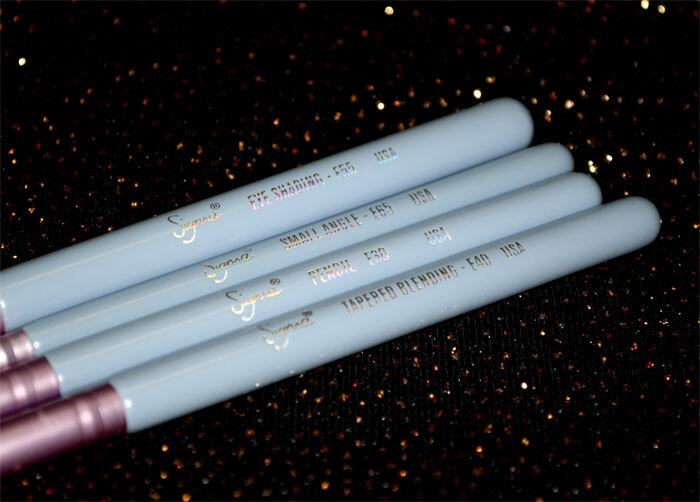 Specially designed to apply and blend colour on the crease. 6) Pencil Brush – E30: Precise application of colour on the crease, outer corner, upper and lower lash line. 7) Small Angle Brush – E65: Essential for the application of gel or cream eye liner on the upper and lower lash line. I’m not sure I’ll get to use the F60 and E65 because I don’t use liquid foundation, concealor and gel or cream eyeliner. I also love this kit because the brushes have short handles, so I can go as close to the mirror as possible when doing my own makeup! The eyeshadow brushes from Make Up For Ever that I currently own are the normal long handled kind, so they can be a bit annoying when I want to see myself up close. Also, the three biggest brushes come with plastic protection around the bristles, which is very thoughtful of Sigma Makeup. The bristles are very soft and are made of Sigmax HD fibers so all of them are vegan. And finally, who can resist the cute blue and pink colours! Do you own any Sigma Makeup brushes? Tom Ford’s Black Orchid, via Kareem Iliya. * This entry contains affiliate links. When you click on such a link and make a puchase, Laced Ivory earns a commission. In this way, you can help support the blog while you shop. Haul: The Sigma Makeup Mrs. Bunny Travel Kit was last modified: December 4th, 2012 by Roxanne C.